Success never lasts for long and forever. One may achieve success at a young age and before one knows it, there comes another individual to supersede and become the new successful idol. This phenomenon occurs constantly in every field of our lives. In another words, ‘success’ never lasts forever. 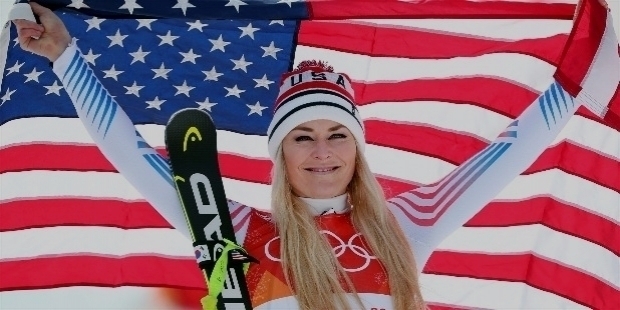 In the world of alpine ski racers, American Lindsey Vonn is one such World Champion. Incidentally, at the recent Skiing World Championship Vonn crashed in her second last race of her magnificent successful career. She couldn’t surpass World’s Greatest Skier Swedish Ingemar Stenmark’s outstanding record of 86 World Cup race wins. In her career spanning 19 years, Vonn has won a superb 82 World Cup race wins. She becomes the second alpine ski racer behind Ingemar Stenmark. However, she is currently the undisputed Woman Champion to hold 82 World Cup race wins at the top. At 34, Vonn had already announced her retirement before the 2019 Skiing World Championship at Are, Sweden. Winning most of the races Vonn entered since the last 19 years, it surely is an emotional challenging stage, when she has decided to hang her skis. She revealed, “The past two weeks have been some of the most emotionally challenging days of my life. I am struggling with the reality of what my body is telling me versus what my mind and heart believe I am capable of. The unfortunate reality is that my mind and body are not on the same page. Lindsey Caroline Kildow was born to Linda Anne and Alan Lee Kildow on the 18th of October 1984 in Saint Paul, Minnesota. Alan Lee Kildow had won National Junior title, when he was young. Little Lindsey was born to ski. If it is to be believed, she started skiing as a toddler. She was trained by Erisch Sailer’s renowned development program at Burnsville’s Buck Hill. Little Lindsey was taught to ski by her grandfather Don Kildow. She was a natural. At the age of 10, a chance meeting with Olympic Gold medalist ski racer Picabo Street was perhaps the turning point for Lindsey. Picabo Street was very impressed with the little girl. Lindsey looked up to Street as her hero and role model. Street went onto serve as Lindsey’s mentor in skiing. Little Lindsey showed immense talent to ski in Minnesota, Colorado as a 7-year-young girl. She was trained at SCV – Ski Club Vail, which was an alpine racing program. She was trained by ‘Gravity Corps’ Ski Coach Colby S. Scudder. Scudder was the only female Coach of Lindsey in pre-age-class program. From an early start, Lindsey showed great potential to take on the world. By the second season, Lindsey was enrolled into the age-class program under SCV Alpine Technical Skiing Coaches Reid Phillips, Chip Woods, Todd A. Rash and Gus Pernetz. In the late 90s, the family moved to Colorado, instead of commuting from Minnesota for Lindsey and her siblings’ growth. The move paid off well. In 1999, Lindsey Kildow and Will McDonald won the ‘Cadets’ slalom events in Italy’s Trofeo Topolino di Sci Alpino to become the first American athletes. Picabo Street had high praise for Lindsey’s performance. Street had revealed, “The faster she went, the bigger the smile she got on her face. You cannot teach somebody to love the fall line like that little girl loved the fall line.” This was a great compliment from the Olympic Gold medalist Picabo Street for Lindsey’s natural instinct. 16-year-young Lindsey Kildow made her debut for the World Cup in Park City, Utah on the 18th of November 2000. The rest has become history now, with as many as 82 World Cup race wins. In 2002, Lindsey made her Winter Olympic debut in Salt Lake City. She raced in both slalom and combined to achieve sixth spot in combined. On the 4th of March 2003, Lindsey won the Silver medal in downhill in the Junior World Championship at Puy Saint-Vincent, France. A bike race with fellow ski racer Julia Mancuso and her father Ciro taught Lindsey to have a killer instinct attitude to become a successful winner. For the first time, Lindsey Kildow was standing on the third spot on the World Cup victory podium in January 2004 at Cortina d'Ampezzo, Italy. On 24th March 2004, she won the downhill Silver medal at the U.S. Alpine Championships at Mt. Alyeska Resort, Girdwood, Alaska. 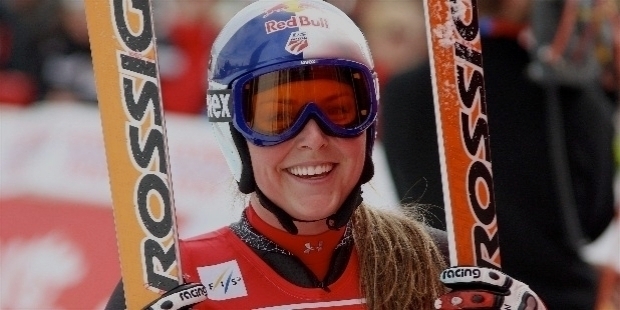 In December2004, Lindsey won her maiden victory at Lake Louise, Alberta. She went onto win 5 more World Cup podiums in the next two months. The 2005 season was not so good for Lindsey, who has had a strained relationship with her father. She returned with a vengeance for the 2006 Winter Olympics. Unfortunately, Lindsey crashed in her second training run downhill in San Sicario, Italy. She was hospitalized overnight. In spite of her injury, Lindsey competed two days later to finish 8th. Her gritty performance won her the U.S. Olympic Spirit Award. At the 2007 World Championships in Are, Sweden, Lindsey won her first big race medals with Silver medals in both downhill and Super-G. She ended the 2007 Season at third spot in Women's 2007 World Cup disciplines of downhill and Super-G. In 2008, Lindsey Vonn lifted the overall World Cup title to become the only second American woman after Tamara McKinney in 1983. On the other hand, American Bode Miller won the men’s title to complete the first U.S. sweep in 25 years, since McKinney and Phil Mahre’s achievements in 1983. Lindsey went onto win the World Cup season title in the downhill and the U.S. Alpine Championships combined title – downhill and slalom. The year 2008 was Vonn’s best victory season of her long career. On March 8th 2008, she set a new American record for the most World Cup downhill victories with 10 wins at Crans-Montana, Switzerland. In 2009, Lindsey Vonn repeated her performance to lift the overall world Cup Champion title. She went onto win the Season Championship in Super-G by winning the final race of the season. She broke Tamara McKinney’s American Record of 18 World Cup wins in February 2009. With 9 World Cup wins, Vonn established an American single-season record by surpassing Phil Mahre’s 8 wins in 1982. In Val-d'Isere, France, Lindsey Vonn won her first World Championship at the 2009 World Championships. 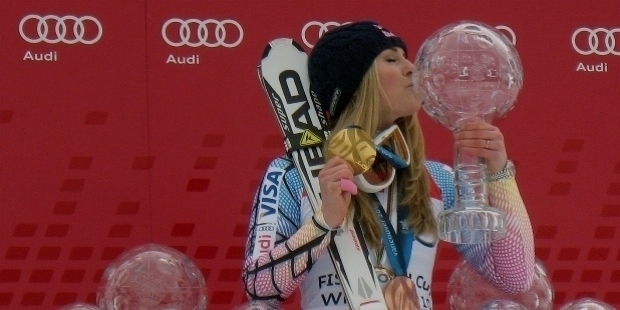 She became the first American woman to win the World Super-G title. In October 2009, Lindsey was awarded the Skieur d'Or Award for her outstanding performance. 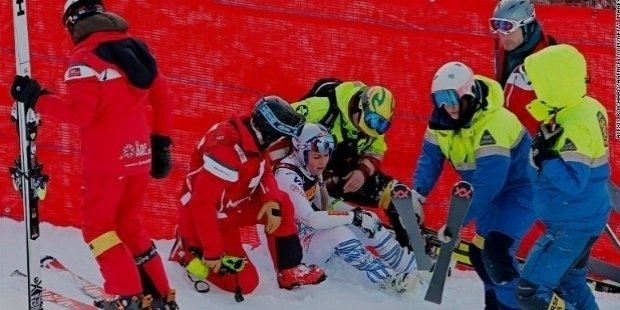 In December 2009, Vonn crashed during the opening run of the World Cup and was injured. In spite of her injury, she continued onto win three straight races in Haus im Ennstal, Austria. These valuable wins raised Lindsey to the second spot among American skiers on the all-time career list for World Cup wins with 28. She superseded Phil Mahre. Lindsey Vonn was named Colorado Athlete of the Year for the year 2009. Vonn surpassed Bode Miller’s World Cup victories with her overall World Cup victories to 33 wins. Her third consecutive overall World Cup title win equaled Phil Mahre's American record. Vonn became the third woman to achieve it, behind Petra Kronberger with 3 straight wins and Annemarie Moser-Pröll with 5 straight wins. 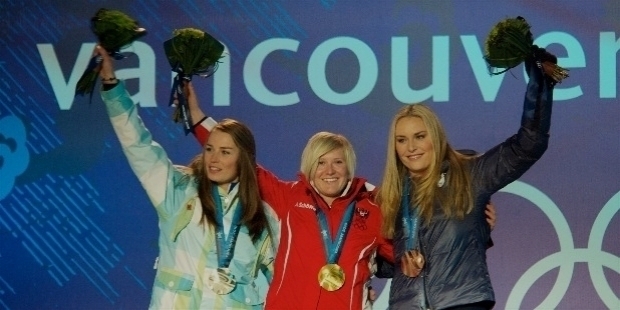 Lindsey Vonn won Gold medal in her first event at Whistler Blackcomb on the 17th of Febraury 2010. She defeated longtime rival Julia Mancuso to become the first American woman to win Olympic Gold in downhill at the Vancouver 2010 Winter Olympics. In her second event – the super combined, Vonn finished first in downhill, but crashed in slalom. Vonn finished third in the Super-G event behind Andrea Fishbacher and Tina Maze. In giant slalom event, due to fog, Vonn crashed in her first run. 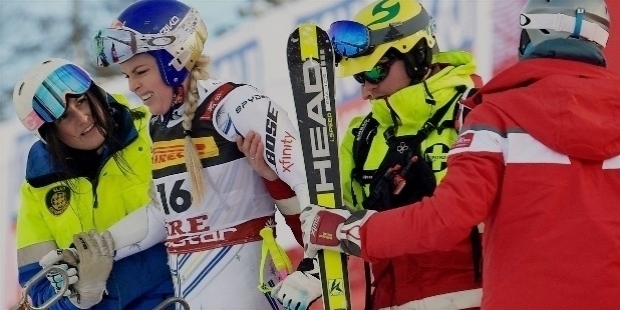 With a broken fourth finger, Vonn lost control in her fifth event – the slalom. In 2011, Vonn faced tough competition from German Maria Riesch. She won 7 races, but could not win slalom events because of Riesch. Maria Riesch’s topped the 2011 season to lift the 2011 Overall Champion. In October 2011, she won her first giant slalom to become the 6th woman to win all events at least once. Lindsey bounced back in 2012 to lift her fourth Overall World Cup title. She overtook Renate Götschl to become the third most successful female World Cup alpine ski racer, in terms of victories. She won her 5th World Cup victory on the Kandahar downhill course at Garmisch, Germany on the 4th of February 2012. With 25 career downhill wins, Vonn surpassed Gotschl’s wins.Vonn went onto lift her 5th consecutive downhill season title on the 18th of February 2012. In the 2013 season, Vonn swept all the three speed races in Lke Louise for her third career hat-trick and increased her record for most career wins at a single resort to 14. Her 56 career total wins placed her on the second place all-time among women behind Annemarie Moser-Pröll with 62. Vonn ended the 2013 season by winning her sixth downhill season title. Vonn did not compete in the Sochi 2014 Winter Games, because of injury. She was disheartened, however, she was eyeing for the World Championships in Vail. She made a strong comeback in 2015 season by winning the downhill event on the 6th of December 2014 at Lake Louise. In January 2015, Lindsey surpassed Annemarie Moser-Proell record for the most World Cup wins ever. Vonn won Bronze medal at the 2015 World Championships in Vail / Beaver Creek, Colorado. 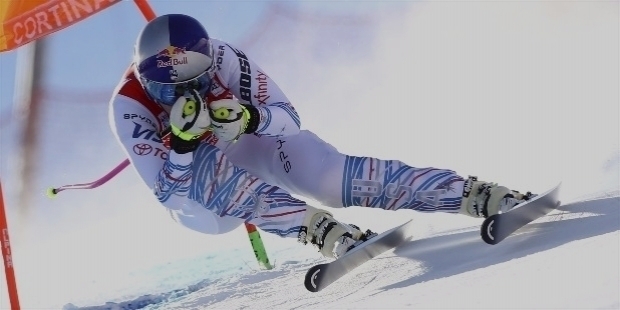 On 18th of March 2015, Lindsey won the last World Cup downhill race at Meribel, France. She went onto claim the World Cup downhill title for the seventh time. She joined Moser-Proell for the women's record of seven globes in one discipline. Lindsey Vonn won the last Super-G race to lift her 8th victory of the season. She also tied with German Katja Seizinger, Austrian Hermann Maier and Norwegian Aksel Lund Svindal for lifting Super-G season title for a fifth time. Simultaneously, she joined Ingemar Stenmark as the only skiers to reach 19 season titles across all disciplines and the overall. She also tied with Moser-Proell’s women’s record to made World Cup podium for the 113th time. In 2016 and 2017, Lindsey Vonn kept dominating the scene with her wins in various events. At the 2018 Winter Olympics, she dedicated her Olympic races to her grandfather, who taught her how to ski. Lindsey got married with fellow 2002 Olympian and former U.S. Ski Team athlete Thomas Vonn on the 29th of September 2007 at the Silver Lake Lodge in Deer Valley, Utah. Four years later, the couple filed for divorce. On 9th of January 2013, they were finally divorced. In 2012, Lindsey met Tiger Woods in a charity event. They began dating by March 2013. However, the relationship ended in May 2015.